Eugene Wettstein was born July 15, 1913 in West Hoboken and grew up in Union City. The son of a butcher and embroiderer, he changed his name to the less Jewish-sounding Wettstone because of the level of anti-Semitism in the U.S. at the time (even though he wasn’t Jewish). Gene joined the Swiss Turverein, where he excelled in gymnastics—so much so that he earned a scholarship to the University of Iowa. As a senior in 1937, Gene was crowned Big Ten all-around champion. He also won NCAA titles in the horizontal bar and pommel horse. He was unusually tall for his sport, standing 6 feet and weighing 170 pounds. In 1939, Gene was hired by Penn State to start a gymnastics squad. He started with a collection of athletes who were performing in a student circus and by 1948 had his first of 9 NCAA championship teams. During World War II, he was in charge of physical training for officer candidates. One of Gene’s greatest contributions to the school was reviving the lion mascot. He wore the costume at sports events in 1939 and 1940 before passing it on the student performers. 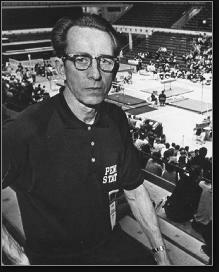 Gene also coached the U.S. men’s gymnastics team at the 1948 and 1956 Olympics. The men failed to win a single medal in those competitions, but Gene’s success on the collegiate level nevertheless made him a legend in the sport. He served as an Olympic judge in 1952 and 1968. The Nittany Lions won more than 200 meets, and three straight national titles from 1959 to 1961. Gene Retired in 1976 having coached 35 national champions and 13 Olympians, including Armando Vega, Gene Whelan, Steve Cohen, Bob Emery and Greg Weiss. Since 1976, the Gene Wettstone Award has been given to Penn State’s top gymnast. Gene died at the age of 100 in 2013.